A cracked, broken, decayed or abnormally worn tooth may not only be an eyesore in your smile, but may also threaten the health of other teeth as well as the overall condition of your mouth. Therefore, repairing a damaged tooth is essential. A dental crown serves both a restorative and cosmetic purpose. Designed to fit snuggly over your tooth, a dental crown will restore both the normal function of a tooth as well as the natural appearance. To maintain your white smile, Creve Coeur dentists Dr. James Feigenbaum and Dr. Jenna Feigenbaum recommend all-ceramic crowns or all-porcelain crowns. For many years, crowns needed to have an underlining of metal for strength. Now however, porcelain, ceramics and other lifelike dental materials are strong enough to hold up to the pressure of biting and chewing. In addition, we have a precise color-matching system, so you can be certain your crown will blend seamlessly with your other teeth, whether it is made of ceramic or porcelain. For most patients, your tooth can be prepared and the crown designed and placed over the course of just two appointments with the best dentists in Creve Coeur, Drs. Feigenbaum. At your first visit for a crown, one of the dentists will remove decay if any is present and file away a small amount of tooth structure from the top and sides of your tooth. This is necessary to ensure that your new crown doesn’t crowd adjacent teeth or interfere with the opposing tooth when you bite. As conservative dentists, Drs. 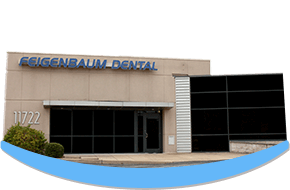 Feigenbaum are both careful to leave as much structure in place as possible, which always makes for a stronger tooth. Once the tooth is prepared, we’ll take an impression that our dental lab will use to handcraft a crown that not only fits the tooth, but your bite as well. At the conclusion of your first visit, we’ll place a temporary acrylic crown on your tooth. This will protect the tooth and allow you to eat as usual. This acrylic crown is held in place by temporary cement, so we recommend that you not floss around this tooth, which could cause it to loosen. The dental lab only needs a couple of weeks to manufacture your new dental crown. At this time, you’ll return to see Creve Coeur dentists Drs. Feigenbaum. We’ll double-check the appearance and fit of the crown before adhesively bonding it over your prepared tooth. With proper care including regular home hygiene and dental checkups, your new crown can last for years and years.